Dutch international Nigel de Jong moved to Germany for a 1,5M€ fee in January 2006. He signed a contract at Hamburger SV until 2010. At that time in Hamburg De Jong joined Dutch players Boulahrouz and Van der Vaart. 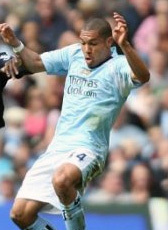 Just a month after extending his contract with another year until 2011, Nigel de Jong moved to Manchester City in January 2009. For a record fee of 19,5M€ he has signed until 2013. In August 2012 he moved to Italy to sign on a 3-year deal at AC Milan. During his stay, his contract was extended until 2018. In February 2016 he decided to terminate his contract and he moved on a free transfer to the United States to sign for Los Angeles Galaxy. In August 2016 just before the closing of the transfer market Nigel de Jong returned to Europe signing for Turkish giants Galatasaray on a 2-year deal. In January 2018 he left the club on a free transfer to join German side 1. FSC Mainz until June 2018. After expiration of his contract he moved to Qatar to sign for Al Ahli.